Figures obtained by The Greens show that since 1997 private insurers have been paid more than $3.9 billion dollars to just manage workers compensation claims. These fees have grown more than 5 times faster than both inflation and actual benefits paid to the injured. This bureaucratic paper shuffling has wasted more than $1.6 billion and eroded the scheme’s financial sustainability. The performance of the bureaucrats and private insurers is even more troubling when the reduction in injuries is factored in. Since 1997 serious workplace injuries in NSW have fallen by 53%, from 60,109 to 28,056 in FY 2010. On these figures, management fees per serious injury have grown 16 times faster than inflation from $2,358 in FY 1997 to $17,001 in FY 2010. The Greens NSW are calling for the NSW government to urgently address this waste and mismanagement in the workers compensation scheme, rather than attack injured worker’s benefits. If private insurer management fees had, like benefits, grown only by inflation then $1.6 billion dollars would have been saved. An analysis by The Greens of WorkCover’s annual returns shows a staggering rate of growth in the fees paid to private insurers to manage workers compensation claims. Over the same period injury rates have fallen and benefits paid to injured workers have barely kept up with inflation. B. Where has the money gone? QBE Workers Compensation (NSW) Limited. Payments made to private insurers are to manage claims and encourage those injured to return to work. The $3.9 billion paid to these private insurers since 1996 has not lead to any significant increase in injured workers returning to work. There has been almost no change in the rate at which injured workers have returned to work since 2003. Management fees paid to the private insurers have grown from just 10% of the cost of benefits paid in FY 1997 to more than 24% of the benefits paid to injured workers in FY 2010. The simple fact is there has been hundreds of millions of dollars wasted every year on endless reporting and form filling by private insurers. 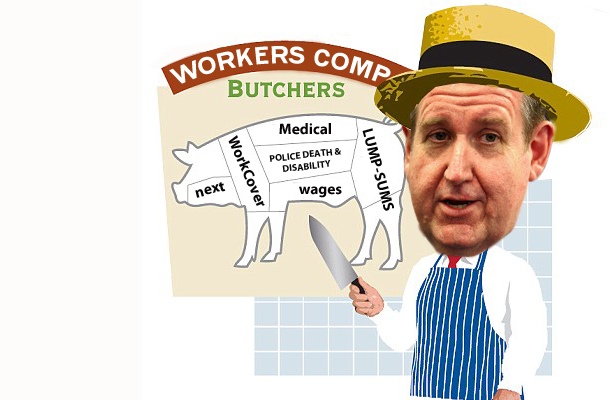 This bureaucratic tangle has been delivered by the agency overseeing the scheme, WorkCover. WorkCover Annual Report 2010/11 page 41 and WorkCover Annual report 2007/08 page 24 (FY 2003 being the first year comparable figures are available as reported in the FY 2008 Annual Report). “Since 1997 payments to private insurers to manage workers compensation claims have grown a staggering 620 per cent faster than both inflation and actual benefits paid to the injured,” Mr Shoebridge said. “In 1997 the fees paid to insurers to just manage claims cost 10 per cent of the amount paid to injured workers; yet in 2010 insurers were creaming off almost one dollar in every four paid to benefit workers. “With more than $3.9 billion dollars being paid to private insurers in the last 15 years, this growth in bureaucratic paper shuffling has wasted more than $1.6 billion and eroded the scheme’s financial sustainability. “These are appalling results and to date no government has had the courage to tackle the real problem in the workers compensation scheme which is this unchecked growth in bureaucracy and paper shuffling. “These figures show that the looming deficit in the scheme is not caused by payments for injured workers which over time have hardly kept pace with inflation. “If payments to insurers had matched inflation, like payments to benefit workers have, the scheme would have saved $1.6 billion. “With over $1.6 billion wasted in overpayments to private insurers, it is little wonder the scheme is facing financial trouble. “This Government needs to hold WorkCover accountable for the staggering growth in paperwork that does nothing other than divert money from injured workers to private insurers. “Before a single dollar is taken from injured workers the government must address the paper shuffling that is chewing up almost a quarter of the money paid to injured workers,” Mr Shoebridge said. And zero incentive to actually help workers! Seriously, WorkCover need to be held accountable for all the misery and suffering these insurers inflict on too many injured workers. Thank you for your interest in fighting for workers rights. As a lawyer representing injured workers I hope that with your help, Unions in NSW and the general public, everyone will realise that it is not the injured workers who are costing the state it is short sited governments handing a blank cheque to the insurers who are costing this state dearly. The problem is that the govt just doesn’t give a rats about the people. From federal to state to local govt theyre all money hungry out for themselves and happy to stand on the “little guy” in the process. Id like to see them struggle on workcover, have numerous surgeries, rehabilitation etc. I know as one facing further debilitating needs that if these changes go through I will lose everything! Thank you David for standing up for the “little guy” that doesn’t get a voice of their own.